In the picture Levitan “Evening. 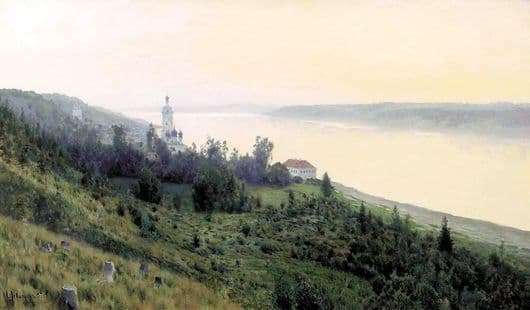 Golden Reach “depicts the slope of the Volga River. The landscape is lit by golden sunshine. A small coastal town appears before the viewer. The canvas depicts a summer sunset. The sun is just beginning to set, because its light so brightly illuminates the smooth surface of the river. In the foreground – the slope of the coast. It is covered with grass faded in the sun. Closer to the Volga begins years. A little distance away – the path that leads to the buildings. Among them – a small house of white stone with a red tile roof, a church and a bell tower of white stone. They give the landscape a special charm and tranquility. Even further amid the haze of the oncoming evening, a few more home can be seen. Most of the buildings of the town are hidden by trees and frequent shrubs. The sun’s rays cover the entire water surface, and it seems that it is not water there at all, but liquid gold. The river seems boundless – the artist has reflected all its natural strength and power. The majestic expanse of the whole landscape is admirable. In the background is the river bank. The haze of the sunset had already fallen a little, all its forms and outlines merged together in a bluish-purple color. The whole shore is wilted in the shadow of the oncoming night, which is about to spread to a small town on the other side. The canvas creates a sense of silence and peace for the contemplator. A quiet flow of water, a calm sunset – all this creates only the most pleasant impressions, evokes memories from childhood. The artist amazingly realistic depicted all the colors of the summer sunset, all the diversity of the beauty of summer nature. Contemplation of the painting “Evening. Golden reach “introduces the viewer into the deepest thoughts, evokes vivid memories, inspires harmony and peace in the soul, gives hope.